New Jersey Municipal Accident Attorneys | Tomes & Hanratty P.C. When we walk through our towns and cities, we are faced with various hazards that put us in danger. We hope that property owners take all the necessary precautions to ensure our safety as we walk on sidewalks, parking facilities, and more. 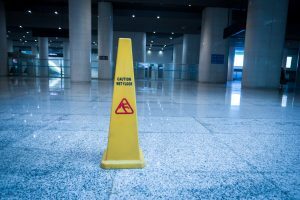 Many slip and fall accidents occur because of the negligence of a property owner. Some of the many hazards we face when navigating walking surfaces include weather conditions, surface issue, and unattended spills and debris. If you were injured by a commercial or private property owner, you would sue for damages that would compensate you for the impact to your life caused by your injury. If you were injured on municipal property, you will endure a more complex and time-sensitive process. If you need a law office with experience bringing legal action to municipalities, contact Tomes & Hanratty, P.C. for a consultation today. Our firm is ready to assess your case and passionately represent your needs. When suing a negligent property owner, you are responsible for proving said negligence. This is called the burden of proof. In municipal accidents, the burden is the same. You need to prove that the municipality knew or should have known about the hazard that caused your accident and did not take the necessary actions to fix the problem and ensure your safety. It is important that you get the medical attention you need. They will be able to tend to your medical needs while documenting the injury, including the time and place it occurred. If you are able, collect evidence for yourself, including taking pictures and talking to witnesses about what they say. If you cannot collect evidence, contact our firm to do it for you. Suing a municipality is a more complex and time-sensitive matter than bringing legal action to a private or commercial property owner. A municipal lawsuit must follow strict guidelines and meet the legal standard of a municipal personal injury claim. The New Jersey Tort Claim Act, also known as Title 59, allows for lawsuits based on personal injury matters. When you have the evidence you need to construct a viable case, you will only have 90 days to file a Notice of Claim. If you were injured because of the negligence of a municipality, you should consider your legal options. Suing a municipality is tougher than most tort claims so it is important to retain the services of an experienced law firm that can effectively represent your needs. Tomes & Hanratty, P.C. has been a legal resource for the people of New Jersey for over 30 years. If you need an attorney to evaluate your case and passionately fight for your future, contact our firm for a consultation today.